The first inside account of the international soccer scandal that rocked the world and the American at its center—the incredible story of how a stay-at-home New York soccer dad illegally made millions off the world’s most powerful and corrupt sports organization and became an unlikely FBI whistleblower. He was the middle-class Jewish kid from Queens who rose from local youth soccer leagues to the heights of FIFA, becoming a larger-than-life, jet-setting buccaneer—and the most notorious FBI informant in sports history. For years, Chuck Blazer skimmed over $20 million from FIFA, stashing his money in offshore accounts and real estate holdings that included a luxury apartment in Trump Tower, a South Beach condo, and a hideaway in the Bahamas. Instantly recognizable with his unruly mass of salt-and-pepper hair and matching beard—and a rotating crop of arm candy—Blazer was one of the most flamboyant figures in the glitzy social and political circles of international soccer. Over the course of thirty years, Blazer leveraged his friendships with the likes of Vladimir Putin, Hillary Clinton and Nelson Mandela, to increase his influence with the mandarins of global soccer—most notably Sepp Blatter, FIFA’s long-time godfather. Once Blatter tapped Blazer to be the first American in almost fifty years to sit on FIFA’s executive committee, the erstwhile accountant steadily accumulated money and power—until 2013 when the FBI and IRS nabbed Blazer and charged him with fraud, money laundering, and tax evasion. 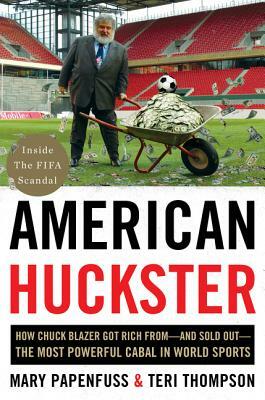 In exchange for immunity, Blazer agreed to let the Feds install a microphone in his keychain to entrap his larcenous band of brothers—leading to the shocking arrest and indictment of eighteen FIFA officials for racketeering and bribery. In this taut and suspenseful tale of white-collar crime and betrayal at the highest levels of international business, investigative reporters Mary Papenfuss and Teri Thompson draw on sources in U.S. law enforcement as well as in Blazer’s inner circle to tell the surreal tale of this astonishing character and the scandal that rocked the world. Mary Papenfuss has worked as an editor at the New York Post, the New York Daily News, Associated Press in San Francisco and Salon.com, and has written for People magazine in Paris, Ozy, the International Business Times, and Reuters. She’s the author of Climb Against the Odds: Celebrating Survival on the Mountain, and Killer Dads: The Twisted Motives that Compel Fathers to Murder their Own Kids. Teri Thompson is a former top editor at the New York Daily News, where she created the newspaper’s award-winning sports investigative team that broke the Chuck Blazer story in 2014. Before coming to the News, she was a sports olumnist at the Rocky Mountain News and an editor at ESPN. She has co-authored two books, including the critically acclaimed “American Icon: The Fall of Rogers Clemens and the Rise of Steroids in America” and is also a member of the Connecticut bar.